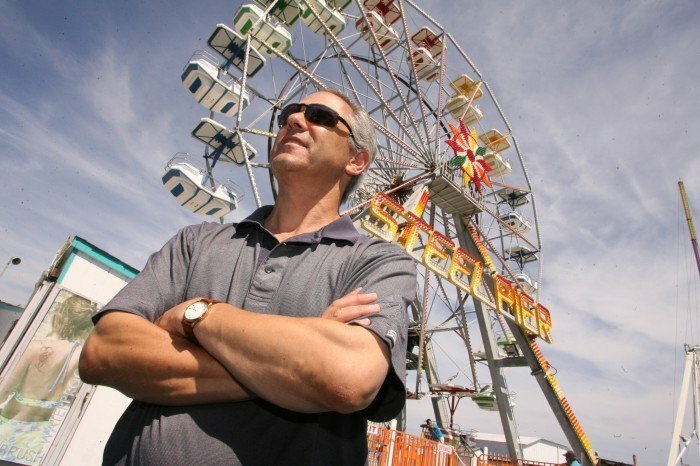 Tony Catanoso, president of Steel Pier. 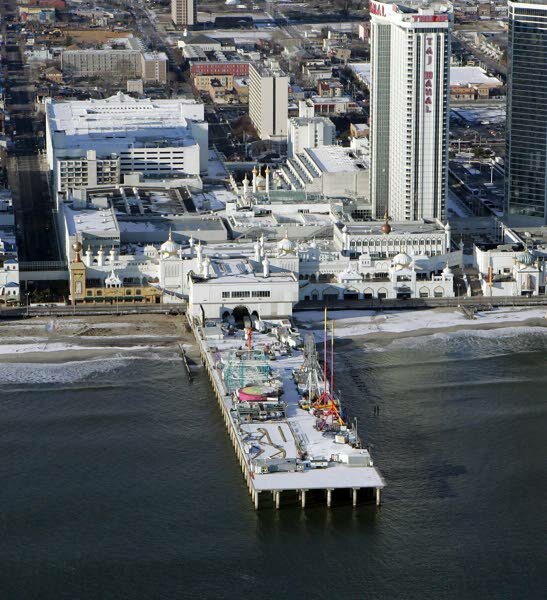 Aerial view of Atlantic City's Steel Pier. Atlantic City’s famed Steel Pier was sold for $4.25 million Wednesday afternoon to the Catanoso family and partners, who have been leasing the pier and operating an amusement park there for 20 years. Trump Entertainment Group had owned the 113-year-old landmark and planned to auction it Aug. 25. But Steel Pier Associates LLC, which was involved in early negotiations with Trump Entertainment, bought the property weeks before the auction. The sale includes the 1,000-foot pier, the buildings and the rights to the name Steel Pier. “To become a stakeholder in the city rather than a tenant means a lot to us, helping us to be a solid participant in the Tourism District,” said Steel Pier President Anthony Catanoso, a co-owner of Atlantic Pier Amusements, which leased the pier from Trump. Steel Pier Associates’ principals include Catanoso, his brothers Charles and William, longtime partner Ed Olwell and new partner Paul Steelman, an entertainment architect who designed the Sands Macao in Macau, China, the company said in a statement. Anthony Catanoso said ownership gives the company more options to develop portions of the property, add amusements and build wind turbines to generate electricity. Catanoso said there will be no noticeable changes this season, although some may be in store for next year, including bringing a new roller coaster to the pier. The sale will also help the company pursue plans to build three wind turbines and a green-energy education center. In February, Gov. Chris Christie signed a measure allowing the tenants to install wind turbines along the length of the Steel Pier. Catanoso said the project stalled because the property owner didn’t sign off for the state Department of Environmental Protection application. Trump Entertainment announced in June its plans to sell the Steel Pier, which is across the Boardwalk from the Trump Taj Mahal Casino Hotel. The opening bid at auction was to be $2.5 million. “We felt we got the best purchase price with the party we sold to rather than going to auction,” said Bob Griffin, CEO of Trump Entertainment Resorts Inc. The Steel Pier has a long, colorful history. It was built in 1898 by a local investment group for $350,000; hosted the first Miss America Pageant in 1921; booked acts as diverse as Abbott & Costello, Frank Sinatra, Ricky Nelson and the Rolling Stones; and was the setting for the famous diving horse attraction. The pier, which had closed in 1978, was destroyed by fire in 1982. It was rebuilt with steel and concrete and reopened in 1992 at less than half its original size. The pier changed hands multiple times in its history. Donald Trump bought it in 1988 through a deal with Merv Griffin. Under its new ownership, Anthony Catanoso sees more opportunities for expansion and long-term planning for his business. The Steel Pier operates from spring to fall and has more than 20 rides and attractions, as well as a helicopter port for rides along Atlantic City’s coastline, the company said in a statement. 1898: Steel Pier built by a local investment group for $350,000.